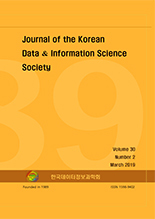 강성석, 이현준, 오경주,(2019).유전자 알고리즘을 활용한 군집화 기반 펀드투자 전략.한국데이터정보과학회지,30(2),285-297. 전세계 금융시장에서 펀드가 차지하는 영향력은 2008년 금융위기와 저금리 기조를 계기로 꾸준히 증가하고 있다. 국내 금융시장에서도 펀드 설정액과 순 자산을 지속해서 증가 추세에 있으며, 운용전략, 성격, 그리고 주요 투자자산 등에 따라 다양한 스타일의 펀드들이 개발/출시되고 있다. 이러한 시장의 흐름에도 불구하고, 펀드 투자와 관련된 의사결정을 지원하는 모형을 제시한 연구는 매우 부족한 실정이다. 기존에 존재하는 선행연구들은 대부분 주식 투자와 관련되어 있으며, 이러한 유가증권시장에서 거래되는 상품들은 일반적인 펀드들과 매우 큰 차이가 있으므로 해당 연구결과들을 펀드 시장에 적용하기에는 어려움이 있다. 이에 본 논문은 국내 펀드 데이터를 기반으로 개발된 새로운 투자 의사결정 지원 모형을 제시한다. 제시된 모형은 높은 성과가 기대되는 펀드를 선별하는 과정과 선별된 펀드들에 대한 투자 비중을 최적화하는 과정으로 이루어져 있으며, 최근 금융 데이터 분석에서 효과적으로 활용되는 있는 인공지능 방법론을 활용한다. 2013년 7월부터 2018년 6월까지의 데이터를 기반으로 실증분석을 진행한 결과, 제시된 모형은 무위험 이자율보다 매우 높은 수익률을 보였으며, 고전적인 균등 투자 유형의 벤치마크보다 우수한 성과를 기록하였다. The influence of funds in global financial markets has been increasing after the financial crisis on 2008 and low-interest rates. Funds setting amounts and asset values are also continuously on the rise in the domestic market, and a variety of funds with different strategies, characters, and main investment assets have been developed and released. In spite of these market tends, there are very few researches which provide a model to support investment on funds. The previous studies about investment are mostly related to stock markets, and the items traded in the security markets are very different from the general funds, so it is difficult to apply those research results to the fund market. This paper presents the new investment decision support model based on domestic fund data. The proposed model consists of the process of selecting the funds expected to achieve high performance and the process of optimizing the investment proportion for the selected funds. The model also utilizes the artificial intelligence methodology that has been effectively applied in recent financial data analyzes. As a result of the empirical analysis based on the data from July 2013 to June 2018, the presented model showed a higher rate of return than the risk-free interest rate and outperformed the classic equally-invested type of benchmark.